1. I'm currently obsessed with the Kao steam eye mask pictured above. I go through these like nothing else. 2. The camera 'lens' or photo effect I am currently obsessed with is called Valentine Martini. 3. I wear jeans about 5-7 days a week. 4. 70% of the times I pair them with my dirty Converse, 30% with flats. 5. I work and play with my old model Fujitsu S series lifebook. 5 years, still going strong. Planning to get a replacement though 'cause I can afford it - yea, hate me LOL. 6. I love pickled ginger - the pink Chinese ones or the pale yellow Japanese ones. 8. 9 out of 10 posts posted here are scheduled at 1 or 2 days interval because this is the way I publish. 9. Currently reading 'the girl who plays with fire', book 2 of 'girl with dragon tattoo'. Good read. Reading slowly though. 10. I am addicted to sniffing my boyfriend. 11. I am vulnuerable to finishing packets of chocolate or chips the moment I open the pack, no matter of the size. 1. What is your go to breakfast? Basically a big mug of Mocha I made myself at the office. 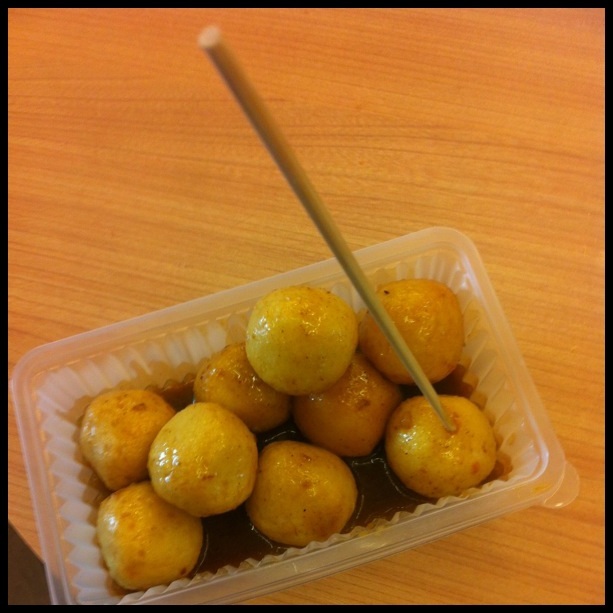 Sometimes with extra fishballs (see above pic) bought at convenient store. Non the healthiest choice but won't kill, will it? 2. What is your favorite food / dessert? Dessert - Creme Brulee, Napoleon, Almond-Tofu, Ice Cream (Belgium Chocolate or similar), Pistachio Gelato, Chestnet + Fresh cream cake. 3. What is the nicest thing your boyfriend/husband ever did for you? Let me hijack his iPhone. Not that I want an iPhone, but I can't part with (my) Tiny Tower. 4. Where is are some places you would want to visit at least once in your life? 5. What is your most unforgettable vacation experience? 2005 World Youth Day @ Cologne, Germany. I met the most amazing host family, Catholic youth and friends. 6. What is your favorite exercise tip? 7. If could only wear one makeup item everyday what would it be? 8. What is your favorite shampoo and why? I have many favourites, but if I had to pick 1, it has to be Tsubaki Hair Spa. You only use this once a week as a clarifying treatment, smells beautiful and works wonders. 9. Do you wear an antiperspirant everyday? 10. If you had to pick one lipstick to wear for the rest of your life which lipstick will it be?Chapstick will probably do. Dr. Hauschka Lip Care Stick (lipbalm). If that doesn't count, then any Lavshuca pink lipstick (pointless to name one 'cause they always change collection, and I never remember their names). 11. And lastly why do you like blogging? I love beauty products. I like jotting down random bits and pieces about them. Want to share what I know and believe in with others. I love reading. Caption. 1 - Tsubaki. 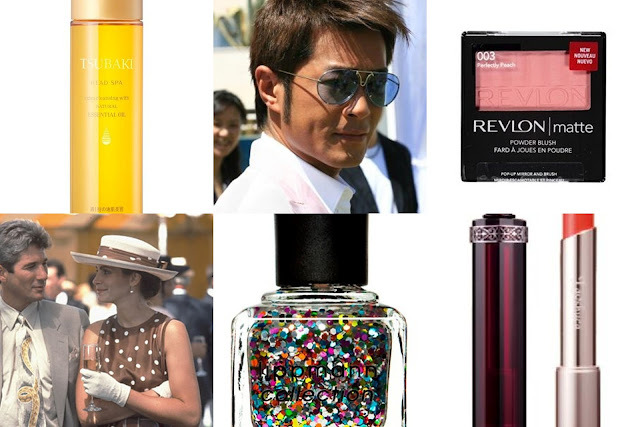 2 - Louis Koo. 3 - Revlon Perfectly Peach. 4 - Pretty Woman. 5 - Deborah Lippmann. 6 - Lavshuca. One - Red roses. Two - Big Sunflower in the fields (when the Sun is shining). Autumn. My birthday season. I can wear whatever I like without worrying about sunburn or freezing. My phone running out of battery? Pathetic but true. A more 'serious' one will be disappointing people who love me - fearful, but this happens all the time. Pathetic, again, but I can't help. 5. Name one celebrity that you don't like? Lady Gaga. I don't get her music. Actually, I think she looks awful. One - Romantic Hollywood, something like Pretty Woman or Notting Hill (yea I like Julia Roberts). Two - Comedy-crime, Ocean's 11, Ocean's 12 that kind of thing (yea Julia Roberts again). Co-star? Chinese - Louis Koo. Caucasian - Richard Gere. Of course if that's Ocean's Eleven, there will be 10 co-starssssssssss... Oops. Hunger Games. Good, but not half as good as the book(s). Burberry #Misty. Revlon #Perfectly Peach. Deborah Lippmann glitters. #Happy Birthday is the best out of the 3 I tried. Burberry #Pale Barley. Integrate #BR750. 1. If you could stop aging at a certain time/age, when would it be? 2. Regardless of nutritious value or calorie, which 1 drink would you drink for the rest of your life? 3. Favourite or current body wash? 4. Favourite or current facial cleanser? 5. What is your last beauty purchase? 6. What skin care item would you like to replenish or try next? 9. Book(s) you enjoy reading and why? 10. If you could make 1 thing disappeared from the Earth, what on earth would that be? If I didn't tag you and you want to do this, do it, and post your link below. I will be more than happy to read more about you! Sweet Tart is one of my fav Revlon Lip Butter colours too :) You should come to Australia, the koalas and kangaroos will be eagerly awaiting your arrival hehe. That's amazing about your Lifeook, geez I wish my laptops lasted half the time! love this tag! I have a few blogs to do but it'll be going up super soon :) thanks for tagging me! I LOVE the "if you could make one thing on earth dissapear" question! I may have more then 1 for that haha!! yay yay - can't wait to read your answers - they must be HILARIOUS. hehe. take your time! would love to know you more and hope you find my questions easy and fun to answer~!~! 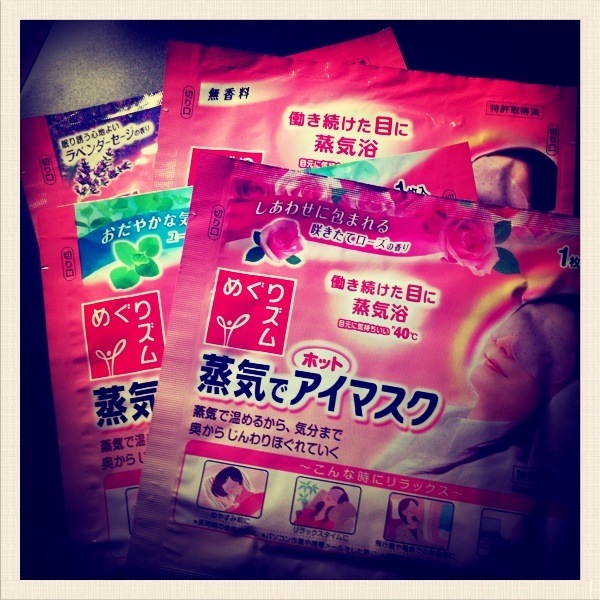 the Kao steam eye masks are more than awesome to me... hehe... waiting for your email.